Fibrogenesis is the underlying mechanism of wound healing and repair. Animal models that enable longitudinal monitoring of fibrogenesis are needed to improve traditional tissue analysis post-mortem. Mayo Clinic researchers generated transgenic reporter rats expressing the sodium iodide symporter (NIS) driven by the rat collagen type-1 alpha-1 (Col1α1) promoter and demonstrated that fibrogenesis can be visualized over time using PET & SPECT imaging following activation of NIS expression. Nuclear imaging of NIS reporter rats would facilitate studies in physiological wound repair and pathological processes such as fibrosis and the development of anti-fibrotic drugs. Figure 1. Characterization of Col1α1-hNIS transgenic rats. (A) SPECT/CT images demonstrate NIS expression in the skin, dental pulp (mandibles) and joints (paws) of Col1α1-hNIS transgenic rats but not in non-transgenic rats. (B) NIS-mediated Tc-99 m pertechnetate uptake is increased at the injury site in Col1α1-hNIS transgenic rats. Only the left shoulders of Col1α1-hNIS transgenic rats have increased Tc-99 m pertechnetate signal at 7 days following rotator cuff injury, even though the left shoulder of the non-transgenic WT rats was also injured. The right shoulder of each rat served as the uninjured negative control for radiotracer uptake. The only system that can image all available radiotracers for NIS-mediated imaging at high resolution: 123I, 124I, 125I, 131I, 18F-tetrafluoroborate, 99mTc-pertechnetate, and 188Re. With a single acquisition, it is possible to directly compare the spatiotemporal resolution of PET and SPECT tracers such as 124I/18F, 123I/99mTc, 123I/124I, and 99mTc/18F. Knowledge of both spatial distribution and kinetics of infection will allow for better understanding of oncolytic virotherapies and help to inform clinical practice and dose determination. 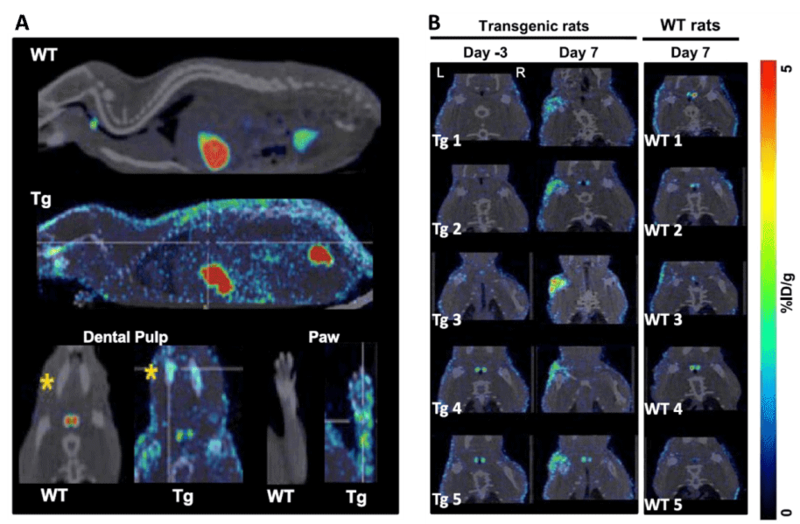 Simultaneous imaging of PET and SPECT tracers with both spatial and temporal co-registration makes the translation from preclinical to clinical tracers a one-to-one process. The system enables radiovirotherapy with 131I and 188Re at high sub-mm resolution.